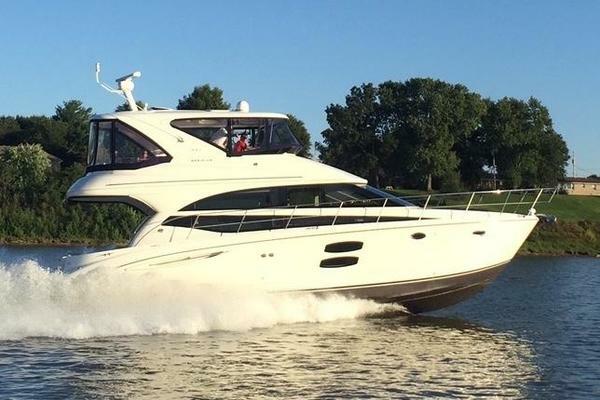 This Sea Ray 420 Aft Cabin features the desirable twin 430 Cummins 6CTA 8.3M Diesel Inboards. Her luxurious appointments, spacious accommodations, and superb seaworthiness provide a cruising environment that will please the most discriminating yachtsman. Molded Vanity w/Sink, Storage & Medicine Cabinet w/Mirror. 316 Stainless Steel Bow Rail w/Safety Line. The Sea Ray 420 Aft Cabin features twin 454 Magnum MPI Horizon MerCruiser inboards. Her luxurious appointments, spacious accommodations, and superb seaworthiness provide a cruising environment that will please the most discriminating yachtsman.